We’d love your help. Let us know what’s wrong with this preview of Ideal Girl by Jenny O'Brien. To ask other readers questions about Ideal Girl, please sign up. I had a lot of fun reading this rom-com book. Think Bridget Jones meets Grey’s Anatomy meets Carry On Nurse! Which makes for an entertaining mix up of image issues, innuendo and romantic tension all with a backdrop of a busy city centre hospital. I don’t know if I’ve ever read a hospital romance before but the setting worked so well as it was a hot bed of young, free and single characters who work hard and who have a lot of steam to let off in their down time. It makes for a book with heart and humour and some very quirky one liners that made me smile knowingly! The main character is Liddy who I immediately liked. She is honest, she is genuine and I could see myself being friends with her. I totally empathised with her lack of confidence and her critical thoughts on her curvy body. Her family background is also developed enough so that we can see what drives her self-doubt and lack of assurance. Her deficiency of dating experience makes her somewhat unusual but that added vulnerability just made her even more likeable. There is a cute romance that felt realistic and I loved that we got to see both points of view. Mitch is bowled over when he falls for Liddy as she is the exact opposite to the Ideal Girlfriend that he had pictured up to this point. I enjoyed watching them get to know each other and slowly build up to something meaningful. And it never got cheesy which I hate. One thing irked me a lot as I read though and it was a character called Donal. In the very first chapter, he groped Liddy at work. And as he is senior to her in the hospital food chain, this really bugged me. Liddy despite being quiet was well able to tell him to back off but it made me uneasy. However he still tried it on again another day. So I was dumbfounded when she later referred to him as ‘a dear’. Nope, he’s not. He’s probably more clueless than anything but that kind of behaviour AT WORK or anywhere is just not on. That aside I loved the humour in the book and the tangled journey through dating misadventures was poignant and entertaining. There was enough conflict to make things interesting but it never felt ott or ridiculous. And the characters pulled me right in and had me rooting for them. Overall this is an entertaining read. It’s a début novel and it does feel like that at times. However the author has knack for humour, snappy dialogue and quirky characters so I know I’d like to read more by her in the future. Who should read Ideal Girl by Jenny O’Brien? I’d recommend this to you if you like books which are romantic but still funny and that have characters that are still trying to figure themselves. 3.5 stars. 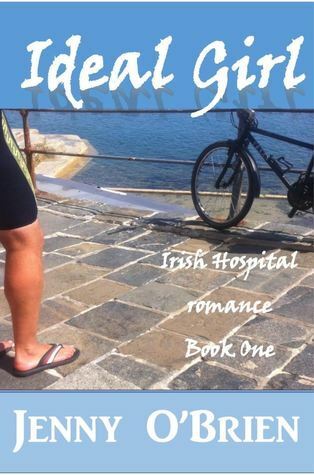 "Ideal Girl" is the first book in the Irish Hospital Romance series by Jenny O'Brien. The title of the book is taken from the idea that the ideal girlfriend is an Irish nurse. In this book, we meet Liddy, a student nurse, who doesn't really think she has time for romance. This book is a good example of how sometimes life has other plans for us. This is a sweet romance that had me aww-ing throughout the book. Liddy doesn't think much of herself. She is just trying to keep her head above 3.5 stars. "Ideal Girl" is the first book in the Irish Hospital Romance series by Jenny O'Brien. The title of the book is taken from the idea that the ideal girlfriend is an Irish nurse. In this book, we meet Liddy, a student nurse, who doesn't really think she has time for romance. This book is a good example of how sometimes life has other plans for us. This is a sweet romance that had me aww-ing throughout the book. Liddy doesn't think much of herself. She is just trying to keep her head above water with this new job. Enter Mitch, a handsome doctor, that has designs on making something with Liddy even if she seems somewhat oblivious. This is a fun, light, and frothy novel that was perfect for whiling away an afternoon. The characters were good. I really liked Liddy. I felt bad for her in the beginning because she had to deal with a character named Donal, who also is at the hospital. He is like the cartoon skunk, Pepe LePew, on steroids. Some of the stuff that he does is really over the top and almost criminal. I liked the way that the author developed the romance between Liddy and Mitch. A charming medical romance. Just enough medical information without overdoing it. Liddy is a lovely & quirky heroine who is delightfully balanced by the equally delightful doctor Mitch. The writing is fresh and sparkling. I expect Jenny O'Brien is going to attract a lot of readers in this genre. First book I have read by Jenny and I really enjoyed it a story that flowed really well ! I love medical romance some of my favourite books! Where to start with this book? I bought it three days ago, and started off by fitting in reading sessions around the housework - an hour here, an hour there... As a fan of romances, it didn't take me long to realise that 'Ideal Girl' is a bit of a departure from the story lines I'm used to reading in contemporary romance - and that in itself was refreshing! Alpha males and strong, feisty females are all very well, but they aren't the be-all and end-all of romance - and they do end up feeling a b Where to start with this book? I bought it three days ago, and started off by fitting in reading sessions around the housework - an hour here, an hour there... As a fan of romances, it didn't take me long to realise that 'Ideal Girl' is a bit of a departure from the story lines I'm used to reading in contemporary romance - and that in itself was refreshing! Alpha males and strong, feisty females are all very well, but they aren't the be-all and end-all of romance - and they do end up feeling a bit 'samey'. What Jenny O'Brien has created, is a love story where both parties have their insecurities. I loved how she gives the reader an insight into the 'Prof's' thoughts, and the worries he has regarding how best to approach Liddy. Liddy, meanwhile, is all too willing to put the worst interpretation possible on his bumbling courtship technique; better she convince herself she's imagined his interest in her than make an idiot of herself...right? Sure, she might get tempted to act rashly/more brazen now and again, but on the whole she does a fine job of keeping her feelings to herself. Trust me: this pair turn the phrase 'dancing around the issue' into an art form! Then, remember me saying I was just fitting the reading sessions in? Well, just over the half-way point something happened, and NO WAY was I putting this book down until I'd finished it. Jenny O'Brien had made me laugh at/with her characters, and then suddenly I just HAD to know what happened to them. I needed them to find their happy ending...somehow...please! And now that I have finished it? I just want to go back and read it all over again. So, if you enjoy contemporary/medical romances, main characters who don't follow the well-worn path of most other romance stories, and turns of phrase that certainly made ME laugh-out-loud, then I highly recommend 'Ideal Girl'. Even the secondary characters made me smile. Research states that Liddy is the ideal girl. Liddy is an Irish nurse. She is passionate about her work and is loving and kind. Her best friend is actively searching for her mister Right, but ever since Liddy's dad left Liddy and her mother she's only focused on her job. When she literally knocks over a professor at the hospital, Mitch Merrien, her luck might be changing. Mitch works hard at the hospital. He's a professor and he has also set up a recovery centre where people can stay until they Research states that Liddy is the ideal girl. Liddy is an Irish nurse. She is passionate about her work and is loving and kind. Her best friend is actively searching for her mister Right, but ever since Liddy's dad left Liddy and her mother she's only focused on her job. When she literally knocks over a professor at the hospital, Mitch Merrien, her luck might be changing. Mitch works hard at the hospital. He's a professor and he has also set up a recovery centre where people can stay until they are fit to go home again. Liddy is not his type of girl at all, but he can't seem to shake off his need to see her and be with her. When a patient dies and her cat needs saving Liddy and Mitch take over this responsibility. They are naming the cat Lucky because that is exactly what he is, being found just in time. Mitch takes Lucky home and hopes he can persuade Liddy to see him in a different light as well. After a horrific accident Liddy falls back into old habits and shuts down from the people around her. What will it take to get her back on her feet again? Her best friend Sorcha is not taking no for an answer and is determined to bring Liddy home. I love to read about romance so it was an easy choice for me to pick up Ideal Girl. The characters are all believable and they just take over your heart while you are reading. Liddy is such a sweetheart, but she is so insecure. She puts thoughts in her head that are not true and therefore makes wrong decisions. I felt for her when she was fighting to get herself sorted out. Liddy is in her final year as a student nurse at one of the busy hospitals in Dublin. She has suffered in the past with the men in her life and is reluctant to share her heart with anyone now. Liddy doesn’t think of herself as ‘a catch’ but a recent poll in the Daily Mail has declared her as the Ideal Girl, much to the amusement of her work colleagues. She’s a lovely, curvy girl with a mass of dark This is the first book I’ve read by Jenny, after reading the synopsis I was intrigued to read more. A novel that both stirs the heart and engages the reader by intertwining love, tragedy, and personal growth of the main character. Liddy, the leading lady, plays her part well, as she portrays a woman with unmistakable strengths such as integrity, intelligence, and compassion while also exhibiting her insecurities with her appearance. I’d dare say; she’s a gal that many women can identify with. Meanwhile, Mitch, a developing love interest, represents a capable partner, while not overshadowing the A novel that both stirs the heart and engages the reader by intertwining love, tragedy, and personal growth of the main character. Liddy, the leading lady, plays her part well, as she portrays a woman with unmistakable strengths such as integrity, intelligence, and compassion while also exhibiting her insecurities with her appearance. I’d dare say; she’s a gal that many women can identify with. Meanwhile, Mitch, a developing love interest, represents a capable partner, while not overshadowing the main character. Of course, adversity throws a curve ball, complicating matters. But, I don’t want to spoil the book by disclosing too much. All in all, it’s a good read that tugs at the heartstrings but doesn’t bog you down too much. I give it two thumbs up. This book’s a page turner, with a feel-good ending, and I got wrapped up in the details and dramas associated with the hospital environment. It was also a real eye-opener. It was quite shocking to see the kind of treatment the heroine had to cope with because of her gender and situation. It really made me feel for her throughout, and ensured I was whizzing through the pages to see how her story would end. I loved Liddy and Mitch. This is a medical romance. It flows like magic across the pages. It will make you laugh and cry. This is a story about normal people like you and me. The plot twist at around 60% left me reeling and turning the pages to find out what happens next. You will have to read it to find out. Jenny O’Brien is a wonderful writer who I will definitely recommend. Will be keeping to reread. There are millions of readers who want an escape from the generally disappointing reality of modern life and this book is a perfect example of how authors can deliver those fleeting moments. Since Jane Austen penned Pride & Prejudice, arguably THE template for romantic fiction, the magic recipe of dashingly handsome, wealthy hero, matched with poor but feisty heroine, mixed against a backdrop of misunderstandings, has proved a winner. O’Brien sets the mood of the piece right from the start, w There are millions of readers who want an escape from the generally disappointing reality of modern life and this book is a perfect example of how authors can deliver those fleeting moments. Since Jane Austen penned Pride & Prejudice, arguably THE template for romantic fiction, the magic recipe of dashingly handsome, wealthy hero, matched with poor but feisty heroine, mixed against a backdrop of misunderstandings, has proved a winner. O’Brien sets the mood of the piece right from the start, with our heroine being a blend of Bridget Jones, Pollyanna and Nurse Duffy from BBC’s Casualty series. She isn’t a supermodel skinny bombshell, but a `girl-next-door’ type of young woman, just finishing her student nurse training. There’s a strident ward sister, a best friend who is more confident, gorgeous and sexually experienced than the heroine, and there’s Mitch, the dashing, Morgan sports car driving, tousle-haired bit of hot stuff, wandering the corridors with a bemused look on his face, as women repeatedly swoon at his feet. There are a few typos here and there, and I’d be the first to admit that my work has them too. Nobody’s perfect. But the overall tone, pace, plot structure and character development is all well thought out, and fluently written. You can tell O’Brien loves Dublin, and more importantly, loves her characters. One mechanism that really works very well is the way O’Brien switches inner monologues from hero to heroine, immediately after various awkward conversations. This device lets the reader get into the heads of the two main characters, feel their confusion, the surging emotions, the love blossoming. That is point of romantic fiction; love is what makes us human, and deep down, all of us want a happy ending. The prologue of this book is so alluring that it gives the urge to find out of what's to come next. It doesn't disappoint! Liddy is a third year student nurse not far from being qualified. She lives a simple life and is very dedicated to her vocation. She lacks confidence in certain areas of her life due to past circumstances. Mitch is a professor in neurology. He is single and hasn't found his ideal girl as yet. He is drawn to long legged blondes. Liddy is having a lousy day. She has a terrible The prologue of this book is so alluring that it gives the urge to find out of what's to come next. It doesn't disappoint! Liddy is having a lousy day. She has a terrible cold and is quite likely to be late for work. She literally bumps into Mitch who is not very impressed to find himself on the floor with bits of wool stuck to his trousers! Whilst Liddy is a brunette, there is something about her which makes an impression on him. Poor Liddy is late and has to face sister Slater who is renowned for being a "dragon", quite common in most hospitals! Mitch comes to her rescue and enrols her to accompany him to see one of his patients. He doesn't hide his interest in Liddy by asking her out. He can pick and choose right? So why me, she asks! The hospital environment and the routines on the wards are very true to life. Not to forget the mandatory nurses/doctors party and the gossipmongers. Liddy is a loving and lovable character. When Donal resorts to undesirable behaviour to get her attention, she gives him the benefit of the doubt, unlike everyone else. It turns out that she is right to investigate the reasons for his "problems". Mitch is hardworking and commited. They really, really like each other but there are misunderstandings causing heartache and misery, leading Liddy to a terrible accident. Heartbroken whilst recovering, she shuts herself off. Mitch is not very happy with the situation but respects her wishes. Will they get the chance to clear these misconceptions? Not being able to see each other is proving to be very depressing. Paul, Mitch's brother and Sorcha, Liddy's best friend are influential and devoted secondary characters. I really like the witty and comprehensive writing style. There is drama but there are loads of love and laughter too. I absolutely love this very convincing read. It's well worth reading. For about 2/3rs/3/4rs of the book I thought it was a pile of rubbish as we so seemed to be covering the same ground in every chapter but then the twist comes and I enjoyed reading it from then on and what saved it from being a 2* review. I'm a wife and mum first, writer second. I took up writing about ten years ago when I had something to say, and I haven't stopped since. I write what I love to read, which is romance and thrillers. My children’s books will hopefully be of some use, particularly Boy Brainy which is perma free and written to raise self-esteem. If you like my writing please get in touch - Hi and thanks for stopping by.